With cool days ahead, it’s a nice time to check out a new indoor venue. 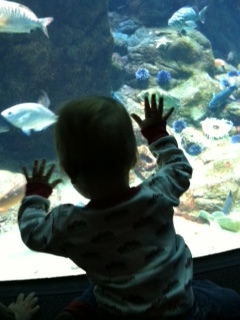 Aquariums are always a hit with my boys. Bobby loves looking for the scuba divers, and CJ likes watching the fish. And, I (to be honest) like sitting down for a few minutes while both of my boys are completely entertained. So, it’s a win win for all concerned. There are two aquariums just a short drive away in San Francisco – Aquarium of the Bay and Steinhart Aquarium in San Francisco. Both are fabulous places to check out. The Aquarium of the Bay boasts 3 floors of fishy fun. It even has a touch pool for kids to get up close and meet some sea creatures. But the most intriguing part of this magical wonderland are the tunnels. With over 300 feet of crystal tunnels, kids get to feel like they’re swimming with the fishes (and scuba divers). Bobby could have spent the day in the tunnels watching the sharks, rays and scuba divers (not to mention running around chasing his buddy). Another amazing option is the Steinhart Aquarium at the Academy of Sciences! Make sure to plan time to visit the coral reef, alligator and penguins! Then, take a stroll across the water walk and watch the rays swim under your feet. There’s a touch pool too that is fully equipped with a step for little ones to climb up so that they can check things out. 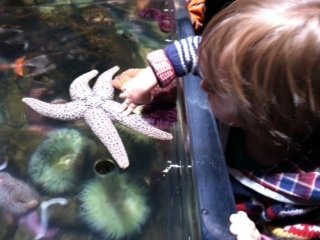 Bobby loved meeting the starfish. CJ was a different story as he was happy splashing in the water. Unsure where to go? Well, let the weather be your guide. If it’s wet out, then I’d opt for the Academy of Science which is a much larger facility. You can spend the entire day enjoying the various exhibits and activities offered there. If it’s dry and not too cold, then check out the Aquarium of the Bay. Located in Fisherman’s Wharf, the location alone offers tons of fun for kiddos. Make sure to check out the outdoor playground and street performers! You may even spot the bush man. This entry was posted in adventures, day trip, SF aquariums, Uncategorized and tagged Academy of Sciences, Aquarium of the Bay, SF Adventures with Kids, Steinhart Aquarium on January 10, 2013 by Modern Mama.